I was just commenting on the origin of that frequency. Earhart didn't know about it and it provided no advantage over 3105 kcs and she couldn't transmit on it anyway. It appears that if would be used for communication with Itasca or other ships since it is a standard marine frequency. Yes, there was a radiotelephone for use between the offshore craft and the Itasca. Following for William Cogswell, Pan Pac Press Honolulu; phone 5573. Following for Amelia Earhart, Putnam: "Portable radiophone on Howland 2670 kcs. Campbell will stand by to answer any questions on runways as you come over island. All here wish luck." I missed that. It appears that somebody had the wrong idea of the radio capabilities of Earhart's radio equipment. That was my first impression, too. But I honestly don't know how a "radiotelephone" or "radiophone" works, nor exactly where or how they planned to have it set up on the island. Perhaps the gear could have received on 3105 kcs and transmitted on 2670 kcs? It's a strange little detail that I haven't seen commented on before. Gary, please allow me another question related to take off distances. If Lae to Howland used almost 1890 feet of runway due to the weight of the plane and a full fuel load, then does that mean it would be the same approx 1890 feet taking off from Howland to Lae. As she would have done on the first world attempt? If yes then would she have used the longer runway? Remembering that the 300 foot extension wasn't there for the first attempt. Purely from the standpoint of interest. It has no bearing on the hypothesis. Thank you in advance. A comment on soft surfaces during takeoff: the takeoff begins with the full weight of the aircraft carried on the wheels. As the aircraft gains airspeed, the wings can begin to carry more of the weight, and the wheels carry only what’s left over. Near the end of the takeoff run, the wings can carry nearly all of the weight, and the wheels only carry a light load. Even soft sand can be strong enough to carry this light load, but it’s only a light load at the end of the takeoff run. Since the workers knew which direction the aircraft would take off (into the wind), they also knew which end could afford to be soft, and which end needed to be firm. A really long crosswind runway is fine if the cross wind is manageable by the aircraft and within the pilot's capability. Taking off straight into the wind is always preferred though. I would not doubt that surface loadings at various phases entered into the planning. But, even softer than desired surfaces may simply be more forgiving in over-run situations if 'prepared' than would be rough, un-prepared surfaces. NR16020 had rather large footprint tires of relatively light bearing. Simply avoiding a blown tire might make all the difference in whether a take-off could be completed or not, if the tires could provide enough bearing resistance to keep the plane 'afloat' and rolling on the surface. The exercise could then have been more about emergency margins than real intent of hard-use runway. I don't know where you got the 1890 foot value from. My prior calculation for takeoff at Lae was 2278 feet without flaps and 1914 feet with 30° flaps. This was at sea level, 85° F, no wind, 1100 gallons of fuel on board making the weight 15,000 pounds. The actual no flap takeoff distance measured by Chatter was 2,550 feet, only 272 feet more than the calculated distance. If you don't believe Chatter then you at least know that the plane could take off in less than 3,000 feet under those conditions. See my prior post here. Since the weather conditions are virtually the same if taking off from Howland to fly to Lae we know that the plane could certainly get off in 3,000 feet and most likely in 2,550 feet or a little bit less without flaps. The north-south runway at Howland was much longer than 3,000 feet and there is no reason to believe that the plane could not take off with a 15 mph crosswind on that runway. If taking off into a 15 mph east wind then the 2,550 feet becomes only 1,867 without flaps and the 1,914 foot flaps down takeoff would only take 1,349 feet so either way the east runway would have been long enough. However, flying to Lae from Howland with the existing, fairly normal, wind conditions on that route the flight would take significantly less time so the plane could have taken off with less fuel. It is 2,556 SM miles and the 25 mph headwind on the leg from Lae to Howland would be a 25 mph tailwind going the other way making the ground speed 50 mph faster and taking about 5 hours less. This means that that flight could be made with about 250 gallons less fuel which weighs 1,500 pounds so the takeoff could have been made at a significantly lower weight of 13,500 pounds which is approximately the same as I calculated for the Howland to Hawaii flight. "Except we know that they had planned to carry only 825 gallons of fuel for the leg from Howland to Hawaii which is only 1892 SM, 664 SM shorter than the Lae to Howland leg. This is 275 gallons less than they carried on takeoff from Lae so the weight of the plane would have 1650 pounds less, only about 13,350 pounds. Doing the same takeoff calculations I have shown before we know that the takeoff distance varies with the weight ratio squared. Report 487 gives 2100 feet for a takeoff at 16,500 pounds, 13,350 pounds is only 0.809 of the maximum weight, which squared equals 0.654 times 2100 feet predicts the takeoff distance at Howland of 1,375 with 30° of flaps. For a no flap takeoff the distance would be the same 0.654 times 2,600 feet for a Howland takeoff distance of 1,700 feet." "From my prior post, the takeoff distance with no wind at Howland is 1,375 feet with 30° of flaps. For a no flap takeoff the distance would be 1,700 feet. A 20 mph headwind would shorten the 30° flap distances by 41.5% and a 10 mph headwind would shorten these distances by 22%. So with 30° of flaps and a 20 mph wind the distance would be 804 feet, with a 10 mph wind it would be 1070 feet. Without flaps, the reductions would be 38% and 20% so the distances would be 1050 and 1356 respectively. BTW, I don't make this stuff up, see attached graph from Aerodynamics For Naval Aviators, the official Navy manual. You can work out the other examples yourself." You can do the calculation for a 15 mph wind. Thanks John, Jeff and Gary. Your replies are much appreciated and helpful to a non pilot type. Gary I am sure I saw the 1890 foot takeoff run number in messages or reports from observers at Lae. In trying to find them this morning I did see another number in the Chater report. He reports a run of approximately 850 yards (2550 feet). I will keep looking for the other two references. Jeff, you raise another interesting point with your notes on the tires. Would landing on an unprepared surface like the reef flat be likely to cause a flat tire or would they actually be better for that type of surface? They were resilient types (balloonish) but aren't exactly without tread toughness. They are similar to what you might know as 'flotation' tires - not far from what is used on light tractors, etc. That type of tire absorbs a great deal of shock and tends to allow rolling over minor deformities without so much upset. A blowout is always possible, but if those tires were in reasonable shape a landing where TIGHAR has theorized should have left NR16020 with pretty reasonable chances of a successful rollout. A 'hard' tire would be an entirely different thing: they tend to have a more compact footprint and therefore bear with more concentration on the surface; a yielding surface will rut more easily under such tires. Harder tires also won't yield as much on uneven ground and will translate more shock into the struts and finally into the airframe. Even though they may look 'tougher', they may actually blow out more quickly in some adverse situation due to less yielding of the sidewalls and tread. This isn't so scientific - just some insight I can offer for what it's worth. My belief is that AE would have found some comfort in knowing additional length was available, even if relatively soft ground: it would have been free of major perturbances that could upset the plane or directly puncture tires. At the end of a take-off run the tires would be somewhat more lightly loaded and might track quite well over the slightly softer ground, if needed, without any trouble. It could also be in the back of your head that you could lose an engine and need to try to stop - or at least control the airplane as much as possible at the end of things. Not a bad hip-pocket improvement to hold if you were in AE's shoes. Thanks Jeff. I believe the tires would have been most helpful on the reef flat due to their less rigid structure. Less likely to blow out. You're description of "balloonish" is a good one. How long does rubber last in a coral environment like Nikumororo? Would the tire survive the reef better than the more rigid aluminum? Would the tire still be identifiable? As a tire? As a tire from the Electra? Would natives have brought tires to the island for any reason with similar tires? Work carts? Americans bringing vehicles? Just thinking that the tires may be in better shape than the airframe due to their more resilient action in the dynamics of the surf. A WWII era tire was found during Niku IIII ("Wheel of Fortune") expedition. This article covers that and other interesting stuff about 'wheels'. Another picture and more analysis of the Electra's tires in this article. Thanks to Marty and Jeff for their recent posts on tires. I had seen these articles before and suggest that if you haven't read them yet then please do so. I always seem to get more from these articles when I see them a second time. Probably because the context is more meaningful. Denise Murphy says, "I've been in the Bishop Museum archives and seen this same photo. 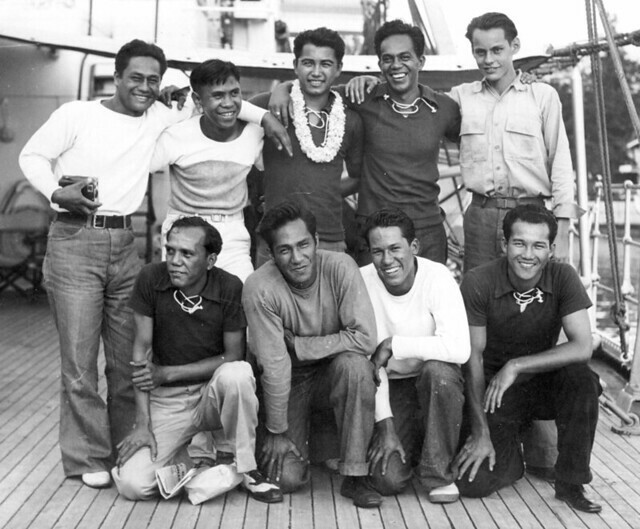 Back row, left to right: Luther Waiwaiole, Henry Ohumukini, William Yomes, Solomon Kalama, James Carroll. Front row, left to right: Henry Mahikoa, Alexander Kahapea, George Kahanu, Sr., Joseph Kim. (George Kahanu, Sr. collection).